We know we just wrapped up our Winter Break, but this week already has us day dreaming about our next big break. Now that we've gotten all the cold weather fun out of our system, we are setting our sights on Spring Break adventures filled with fun in the sun, warm ocean breezes, yummy fruity cocktails and ending with spectacular golf. With both Spring Break and The Masters falling in the same week, we've decided it will be the preppy mom's dream week (both hands raised and waving!). We've already begun planning our perfectly preppy attire and putting our favorite monogrammers on standby. Here are some of our favorite preppy (and personalized) essentials that we can't wait to pack in our bags for Spring Break! If there is one thing we just love, it's dressing our kids in coordinating outfits. 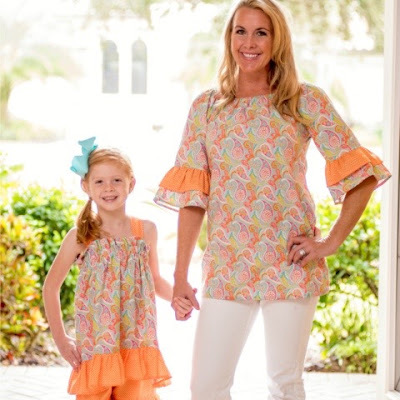 When we head to the beach for Spring Break (and this summer) one thing that is always in our bags are bright colored outfits that are so sweet and so southern. This paisley resort collection has something for everyone and is so, so sweet for spring and summer. That bubble is just presh and the halter with the orange ruffle accents is too cute! 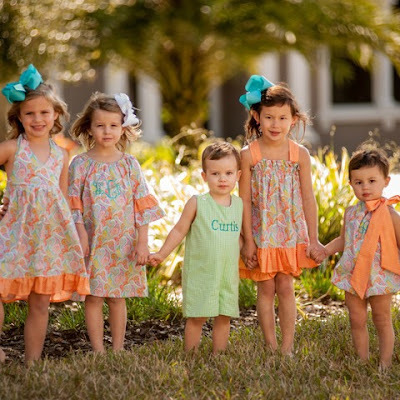 An added bonus is being able to match the kids in coordinating resort tunics with us mamas. My girls would just LOVE to match me. Might have to order this! No one likes sunburnt shoulders, but it seems that no matter how much sunscreen we apply to our little ones, those shoulders always ended up burnt. The perfect solution is to just cover them right up. These adorable ruffle rash guard swimsuit sets are made with sun protectant fabrics and are just perfect for any little girl. They come in 7 different colors and our hardest decision has got to be deciding which colors we want. These will be a must have for our long days in the sun! One thing we struggle most with when heading to the pool or beach over Spring Break, or really any day for that matter, are the giant bags we have to carry to accommodate all of our things. From sunscreens to snack and towels to toys, even the biggest of big bags sometimes aren't large enough. 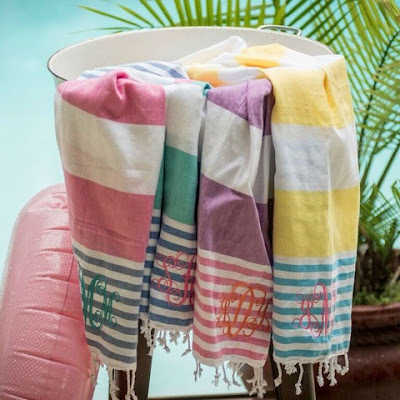 That's why when we first learned about these turkish towels we were instantly intrigued. They are super thin, yet absorbent towels made from 100% Turkish cotton. AND, they are super cute and super preppy with the stripes and monograms. These would be a dream to be able to fold up and fit easily into our bags, making the load we have to carry so much more manageable. 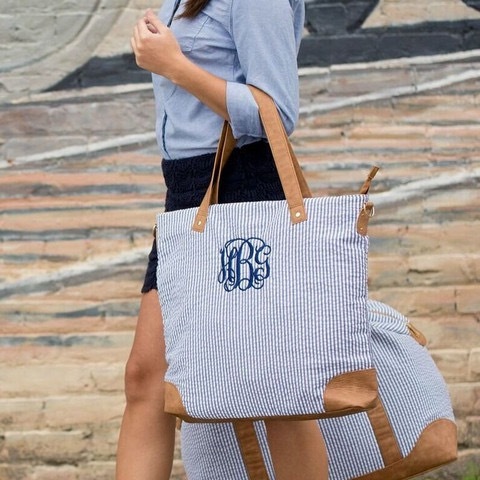 Ok, really they had us a seersucker, but throw a monogram on that bad boy and we are head over heels for this shoulder bag. It's no secret we love our seersucker and we both obviously are still rocking the mom bag. The bigger the better in our case! Especially when we are traveling for Spring Break, but really for everyday we need a cute and stylish bag to carry everything from iPads to sippy cups, plus all of our own things, too. This shoulder bag also has a coordinating weekender bag available that would be absolutely perfect to pack for a quick trip! 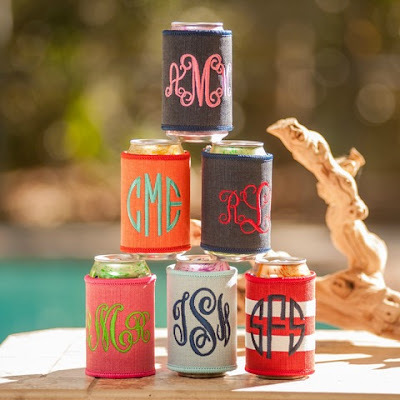 Last, but certainly not least, let's not forget about a cute koozie to keep your beverages cool. These would be so simple to throw in your bag for a Spring Break trip and are a must-have in our eyes. Whether it's sparkling water by the pool or a cold one on the beach, no Spring Break would be complete without a little something we like to call "mama's water" and something to make you look stylish while you sip away in the sun. Psst...We also think these would be fantastic teacher gifts! What better way to show a special teacher a little love than to slip her one of these before her Spring Break getaway! What are some of your favorite Spring Break essentials?